HOUSTON – The Texas Southern Lady Tigers softball team dropped a close call on Tuesday losing to Houston Baptist 3-2 at home. Rebecca Villareal went the distance for Texas Southern pitching seven innings allowing two earned runs on five hits while striking out three batters. Villareal pitched six scoreless innings during the contest but it was a troublesome third inning that allowed Houston Baptist to score the runs they needed to win. After starting the inning off with a foul out to third baseman Haley Smith, HBU got their first runner on base on a TSU infield error. Later in the inning the Huskies would capitalize on bases loaded as one batter was hit by a pitch scoring a run. A single to center field scored two more runners as Houston Baptist took a 3-0 advantage in the third inning. A lead-off walk followed by a Husky throwing error, put Lady Tigers on second and third with nobody out in the bottom of the fourth. The Huskies looked like they would get out of the inning unscathed, as they got a popup, then a leaping catch in left-center field. Precious Alvizo at third base tagged and slid under the tag at home scoring TSU’s first run of the game. The Huskies then threw to third and got a TSU runner out to end the inning, with only one run allowed, as HBU led TSU after four, 3-1. There were back-to-back 1-2-3 innings for both teams, until a one-out double by HBU in the top of the seventh gave the Huskies their fifth hit of the afternoon. TSU got out of the inning unscathed with two fly outs. Texas Southern got to within a run following a blast to left field by Jessica Haynes to lead off the seventh inning. Fitima Alvizo followed that with a single, then an error put the tying run in scoring position and the go-ahead run on base. But the Huskies got out of the jam with a flyout and a groundout to end the game. In the bottom of the seventh inning it looked as if Texas Southern was poised for a late game comeback as Haynes led the inning off with a solo homerun to left field closing the gap between TSU and Houston Baptist at one run (3-2). Keely Shuler pitched a complete game for HBU allowing two earned runs on six hits. 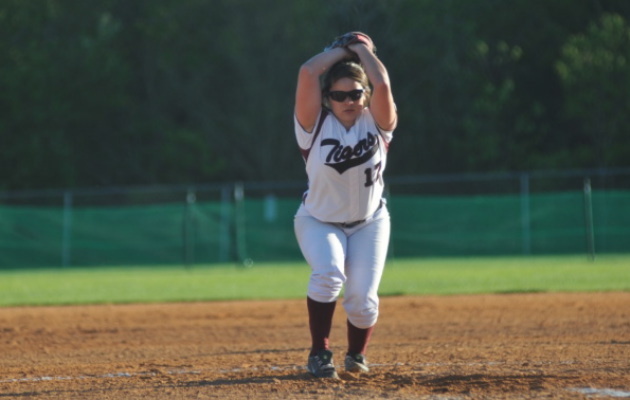 Giana Robinson drove in the Lady Tigers only other RBI in the game on a sacrifice fly to left field in the bottom of the fourth. The Lady Tigers will get set to begin Southwestern Athletic Conference play in the upcoming weeks.